Is it me or did the 2012 Mutua Madrid Open seem much more exhausting to watch than normal? I personally liked the blue clay, I thought it was a nice addition to the surface colors, though not everybody was a fan. If you watched any of the tournament, you saw that the blue clay seemed pretty dry, speeding up the court, dust would kick up on serves and the players seemed to struggle with their footwork. The bigger surprises were that both Rafael Nadal and Novak Djokovic lost in earlier rounds of the tournament, Rafa losing to fellow countryman Fernando Verdasco in the third round, and Novak also losing to a fellow countryman Janko Tipsarevic in the fourth round. Both matches were exceptional, Verdasco and Tipsarevic played extremely great matches. However, both Nadal and Djokovic had some frustrations with the blue clay court surface, “I tried my best to prepare but I wasn’t good enough to adapt my game to this court, the only thing that I know is that if things continue like this I am very sad but next year will be one less tournament in my calendar.” – Rafael Nadal said after his loss to Verdasco. Novak also had some words after his loss to Janko, “They can do whatever they want. I won’t be here next year if it remains the same. I’m really looking forward to come back to the real clay. This was a test and it failed to my eyes.” The two have already decided to not participate in the tournament next year, if it’s not changed back to the slower red clay. Being the greatest of all time in tennis requires adaptability to different conditions; nobody can control the weather and players seem to adapt to the wind, temperature, sun, evening, etc. I think it’s a joke that these two have any issue with the blue clay of Madrid, learn to play on it better. In other news, Roger Federer did the opposite of the two crybabies, he won the darn thing. It wasn’t easy for the Swiss, he faced a very powerfully dominated Czech, Tomas Berdych. It was clear in the first set that Tomas was out to outplay Roger by taking the first set 6-3. That was not going to set well with Fed, he adapted his game to play smarter, more tactical tennis. Roger Federer realized he was Roger Federer and pull out the title in Madrid. I applaud his victory. To add to Roger’s victory, Federer moved up one spot of the Men’s ATP world rankings, to #2. With the win in Madrid, Fed takes the #2 spot from Rafael Nadal…without complaining about the conditions. He did what he had to do to play his best. I have the feeling that Roger Federer will regain the #1 once again by year end and claim another record (most weeks at #1, currently held by Pete Sampras – 286 weeks). Good for him. Weenies or not, Novak and Rafa need to get over themselves. If you hate the blue surface, then don’t play without making threats. 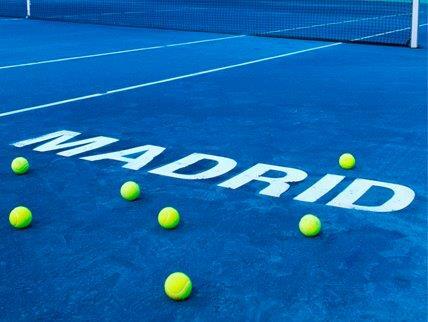 I hope Madrid keeps the blue clay court, I like it.